To find a reliable partner for restaurant equipment, North Shore restaurants come to United Service Co. We’ve been in business since 1953. Our family owned and operated company has built a reputation for success in HVAC, refrigeration, and restaurant equipment service over the years. If you’re tired of accommodating the shortcomings of ovens, fryers, stoves, and more, come to our team for expert advice and custom recommendations. We strive to make your kitchen equipment work for you. Give us a call for more information about restaurant equipment in North Shore. Your business relies on restaurant equipment in North Shore to perfectly poach, fry, and sauté ingredients. 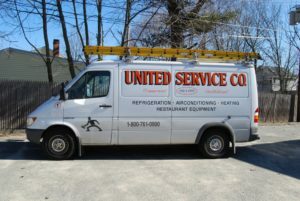 At United Service Co., we understand how restaurant equipment in North Shore affects business success. We offer complete appliance sales, installation, and repair services to help keep your establishment up and running no matter what. Restaurant equipment keeps your food piping hot and ready for consumption. A slight error in accuracy could harm your business reputation. If your business needs an appliance to run with precision, our expert technicians can help. Come to us for sales, replacements, and servicing for gas, electric, and steam appliances in the restaurant industry. Read more about our restaurant equipment services. Without reliable equipment, a restaurant cannot succeed in today’s competitive foodservice market. At United Service Co., we understand the challenges of running a modern restaurant. We strive to deliver comprehensive support to hospitals, professional building cafeterias, processing and manufacturing plants, schools, grocery stores, and more. If you need new restaurant equipment in North Shore, service, or replacement equipment, remember our team. For the last 60+ years, we’ve offered memorable services for all restaurant equipment. Read our testimonials and see why more locals prefer our company over large equipment dealers. Restaurants need reliable equipment and service providers. At United Service Co., we offer turnkey services restaurant owners can rely on over time. We GPS monitor our responding technicians to ensure timely and satisfactory service. Our licensed and trained technicians understand the importance of regulatory compliance and satisfactory work. In addition to our restaurant equipment support, our team handles complete HVAC and commercial refrigeration services. We create, install, and maintain systems from Boston, Mass., to Portland, Maine. Whether you’re upgrading existing appliances or developing a maintenance plan, we can help you get ahead in the restaurant industry. We offer free equipment inspections and estimates for your peace of mind. Contact us 24/7/365 for expert restaurant support. For more information on restaurant equipment, North Shore business operators can reach our team at (800) 761-0900 or (978) 750-5600.